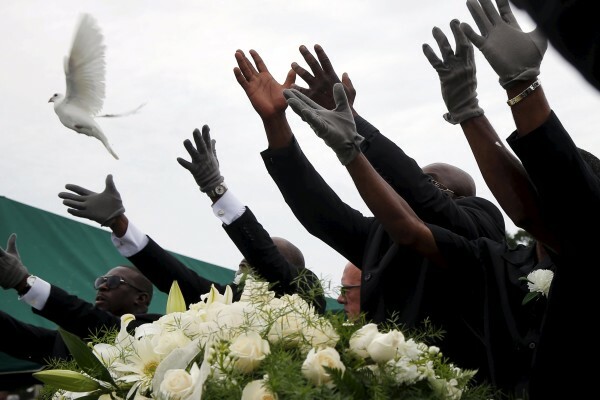 Pall bearers release white doves over the casket of Ethel Lance as she is buried at the Emanuel African Methodist Episcopal Church cemetery in North Charleston, South Carolina on June 25, 2015. Lance was one of the nine victims of the mass shooting at the church last year. He was a child. He was an innocent child who was outside playing. The people we paid to protect him, the police, murdered him. I don’t care what the court says. The child was murdered. I’ve started and stopped writing my column several times this month. Climate justice has been on my mind, as have the lives of refugees in Maine. So have housing, recovery from substance use disorders and how we raise our children to feel safe but not ignorant. Several of the columns I started could have been solid, with well-considered and well-researched opinions. But I can’t get that smiling child’s face out of my mind. Tamir Rice was a child. His sister, now trying to survive the extreme trauma of her brother’s death and the police assaulting her, is a child. These children should be safe; we should and must keep our children safe. And then I see Sandra Bland’s face. I see the face of a woman who did nothing wrong. She was simply a black person in our brutally racist country. She was killed, and the murderers got away with it. I see the blur of nine black faces who were murdered in their church last year in South Carolina, and I see the white terrorist who killed them being fed some Burger King food after he was arrested. What kind of world is this? This is not a world I want my children to know. But I will make them know it. The murders of black and brown people obviously are wrong. Anyone who has a brain can see that. But the slow death of people of color in America because of the trauma of racism is insidious and pervasive. We have to face it and fix it. The only solution is reparations. In the case of the United States and what I’m discussing here, reparations consist of repairing the damage done from hundreds of years of holding human beings prisoner, forcing them to do hard labor until they died, refusing to grant them access to land ownership, education and even a sense of basic personal safety. Yes, it is possible and plausible. It’s the only way we can fix our broken and imploding system. Ta-Nehisi Coates writes about it more clearly than I ever could in his June 2014 article in The Atlantic. If we were to make reparations a priority — offering relatively significant benefits to low-income black and brown people immediately during the planning phase, which wouldn’t cost much — we could begin to improve the lives of everyone in our country. Of course, there are significant logistical questions for the necessarily more expansive reparations required to fix our broken system. We must begin answering those questions now. If you look at the immediate objections to reparations, you’ll see that the objections are almost all founded in racism. “But there are poor white people! That’s not fair!” True. But all white people have benefited from slavery, even though there are some cases where that benefit is negligible. And that’s not fair, either. Go ahead, try to find an argument against reparations that isn’t founded in racism. There isn’t one. To save our country, to keep our children safe, reparations is our only solution.